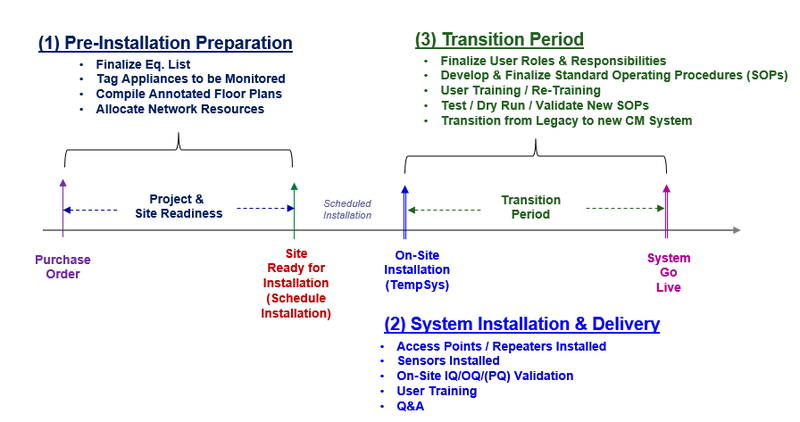 Transition Period – The Post-Installation Transition Period (“TP”) is defined as the point in time immediately following the installation and validation of the CM system until the system becomes the new system of record, which oftentimes is referred to as the “Go-Live” day or event. Note that both the legacy system and new CM system are run in parallel prior to Go-Live. Refer to Figure 1 for an illustration of where and how the TP fits into the overall project. Running Systems in Parallel – It is recommended that the legacy and new CM system be run in parallel for a period of time between the completion of initial installation and the actual Go-Live date. This parallel effort does require a significant amount of time and resources to manage, but oftentimes it is necessary because of the need to complete any Supplemental Validation protocols prior to Go-live. Running two systems in parallel also allows the end users to compare results of the new system against the legacy system. Users may even find significant discrepancies between the two systems, which otherwise may have gone undetected. As an example, some organizations find that the new CM system “lights up like a Christmas tree.” Why? Some organizations may be transitioning from a manual paper log system, with temperatures recorded by hand one or more times a day. With a new CM system, temperatures are measured and recorded much more frequently, and end users may find that appliances may be out of allowable temperature limits many times during the day (e.g., when appliance doors are opened during restocking or inadvertently left open). In this scenario, appliances may need thermostats adjusted, and select appliances may need to be replaced altogether. Some organizations elect to not run two systems in parallel and simply “Go Live” immediately following system installation and hand-off from the vendor. If this option is elected, comprehensive training, planning and coordination must be in place prior to system validation and handoff to the end users. User Training – Perhaps the most important TP activity, ensuring that all staff members who have responsibility for using and managing the new CM system are properly trained and have a good working knowledge of the new system is vital. Modern CM system software is designed with many advanced features and functionality, so learning all the “ins-and-outs” of how the system works will likely require a significant investment in time and resources. Make arrangements with your vendor to provide adequate and comprehensive training, including supplementary on-site training as needed. Standard Operating Procedures (“SOP”) – After users have been trained on how to use the new CM system, draft SOPs may need to be revised. It is commonplace for users to require additional steps and/or clarifying information in the SOPs. Before a system can Go-Live, all SOPs must be approved and adopted. Once SOPs have been adopted, formal Dry Runs are recommended prior to the Go Live day. Supplemental Validation – Some organizations have Quality Assurance (“QA”) requirements that mandate supplemental validations to be completed following the vendor’s initial system IQ/OQ/(PQ) validation. The purpose and scope of these supplemental tests is to complete additional tests to verify/validate functionality or repeatability (performance) that may not have otherwise been tested as part of the vendor’s standard IQ/OQ/(PQ) protocol. System Go-Live! – Go-Live is the day or event when the legacy system is decommissioned and the new CM system is the system or record. If the Transition Period is well-managed, the Go-Live should be rather un-eventful, which means the TP process was a great success! In preparation for the transition, are there Standard Operating Procedure templates that we can start with? Based on other customers in the same line of business and of similar size, what were the biggest challenges they faced and what were the solutions? Are you ablt to provide us with your recommendations and/or a Transition Plan that details the scope of work, deliverables, schedule and project costs?